Earthquakes and volcanoes are examples of sudden movements which originate from inside the earth. We have already seen the types of volcanoes. But, what is an earthquake? To put it simple, earthquake is the shaking of the earth. An earth quake can be defined as a sudden violent shaking of the ground as a result of movements in the earth’s crust or volcanic action. These movements result in the release of energy along a fault and cause the earth to shake. An earthquake, like volcanoes is a type of endogenic processes. Earthquakes: Points you should not miss! The network of seismographic (seismograph is the instrument used to measure earthquakes) stations all over the world record dozens of earthquakes every day. Most of them are not felt by human beings as they are minor quakes only. 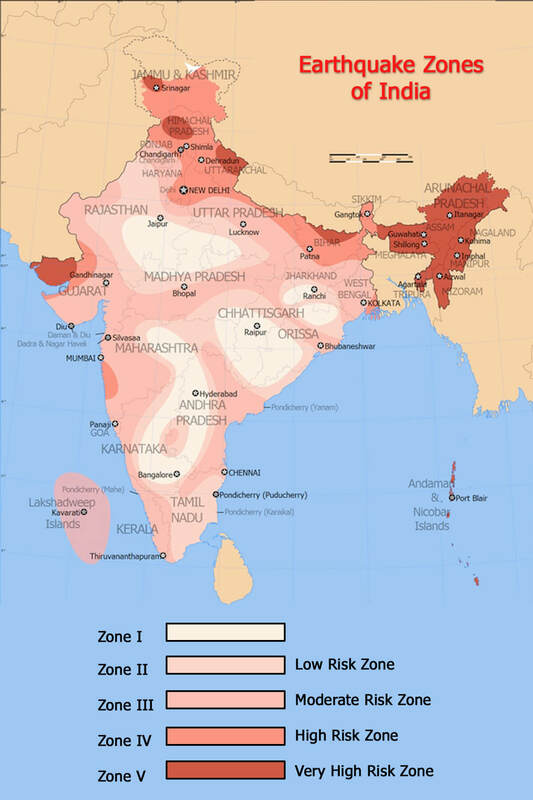 The occurrence of a severe earthquake is limited to a few regions in the world. 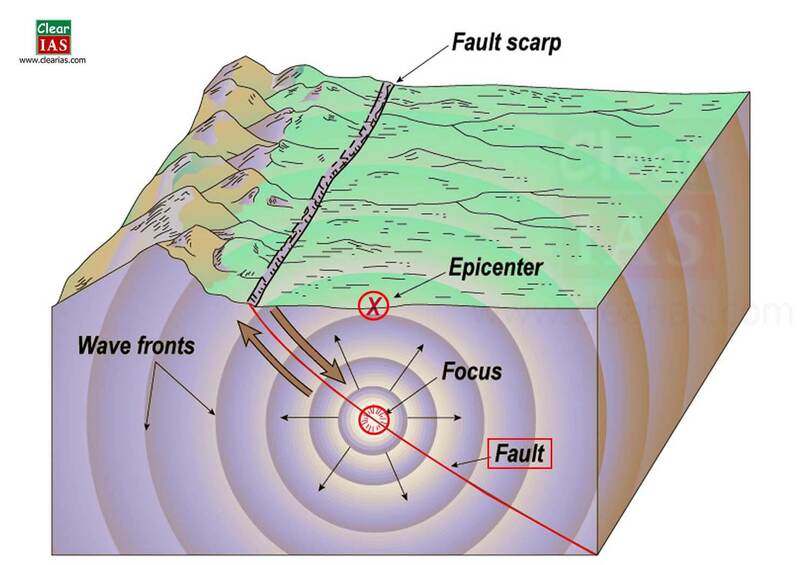 The point within the earth’s crust where an earthquake originates is called as the focus or hypocenter or seismic focus. It generally lies within a depth of 6 kms in the earth crust. The point vertically above the focus on the earth’s surface is called as the epicenter. The intensity of earthquake will be highest in the epicenter and decreases as one moves away. All natural earthquakes take place in the lithosphere (i.e, the region which constitutes the earth’s crust and rigid upper part of the mantle). The earthquake which originates in the lithosphere propagates different seismic waves or earthquake waves. They are generated due to the release of energy at the focus and moves in all directions traveling through the body of the earth. Hence, the name – body waves. They travel only through the interior of the earth. Body waves are faster than surface waves and hence they are the first to be detected on a seismograph. There are two types of body waves as primary waves and secondary waves. 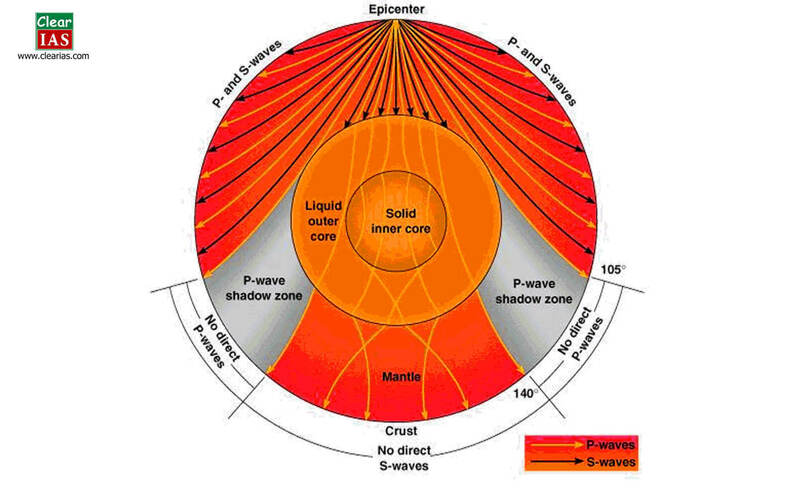 Primary waves are the fastest body waves (twice the speed of s-waves) and are the first to reach during an earthquake. They are similar to sound waves, i.e, they are longitudinal waves, in which particle movement is in the same direction of wave propagation. They travel through solid, liquid and gaseous materials. They create density differences in the earth material leading to stretching and squeezing. They arrive at the surface with some time-lag after primary waves. They are slower than primary waves and can pass only through solid materials. They are transverse waves in which directions of particle movement and wave propagation are perpendicular to each other. When the body waves interact with surface rocks, a new set of waves is generated called as surface waves. These waves move along the earth surface. Surface waves are also transverse waves in which particle movement is perpendicular to the wave propagation. Hence, they create crests and troughs in the material through which they pass. Surface waves are considered to be the most damaging waves. Two common surface waves are Love waves and Rayleigh waves. This kind of surface waves causes horizontal shifting of the earth during an earthquake. They have much slower than body waves but are faster than Rayleigh. They exist only in the presence of semi-infinite medium overlain by an upper finite thickness. Confined to the surface of the crust, Love waves produce entirely horizontal motion. These waves follow an elliptical motion. A Rayleigh wave rolls along the ground just like a wave rolls across a lake or an ocean. Because it rolls, it moves the ground up and down and side-to-side in the same direction that the wave is moving. Most of the shaking felt from an earthquake is due to the Rayleigh wave, which can be much larger than the other waves. We already discussed that p-waves pass through all medium while S-waves passes only through solid medium. With the help of these properties of primary waves, seismologists have a fair idea about the interior of the earth. Even though p-waves pass through all mediums, it causes reflection when it enters from one medium to another. The variations in the direction of waves are inferred with the help of their record on seismographs. The area where the seismograph records no waves is called as ‘shadow zone’ of that wave. Accordingly, it is observed that the area beyond 1050 does not receive S-waves and the area in between 1050 to 1400 does not receive P-waves. Seismometers are the instruments which are used to measure the motion of the ground, which including those of seismic waves generated by earthquakes, volcanic eruptions, and other seismic sources. A Seismograph is also another term used to mean seismometer though it is more applicable to the older instruments. There are two main scales used in the seismometers: (1) Mercalli Scale and Richter Scale. The scale represents the intensity of earthquake by analyzing the after effects like how many people felt it, how much destruction occurred etc. The range of intensity is from 1-12. The scale represents the magnitude of the earthquake. The magnitude is expressed in absolute numbers from 1-10. Each whole number increase in Richter scale represents a ten times increase in power of an earthquake. There are two well-defined belts where earthquakes frequently occur – The Circum-Pacific Belt and The Mid-World Mountain Belt. About 68% of earthquakes in the world occur in the Circum-Pacific Belt. Mid-World Mountain belt extends from the Alps with their extension into Mediterranean, the Caucasus, and the Himalayan region and continues to Indonesia. 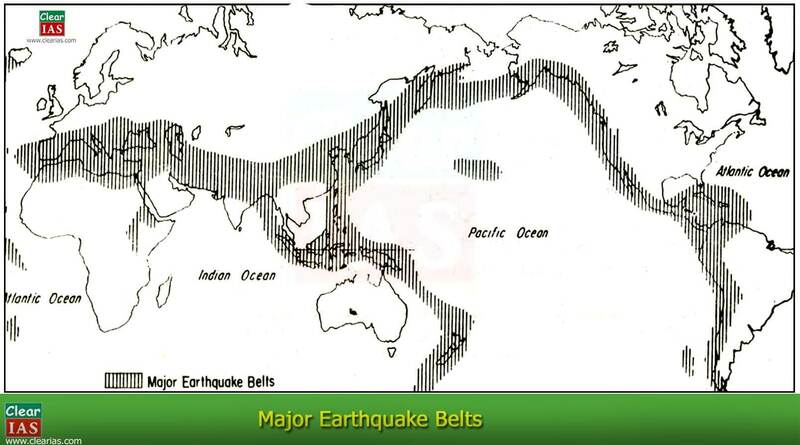 21% of earthquakes are occurring in this belt. The remaining 11% occur in the other parts of the world. Next in the series: Exogenic Forces and their classification. This the best piece of work I have read so far! Precise yet detailed. Easy to understand and the phrasing is really good. Thank you so much! superb sir, for me it was never so easy to understad.Thank You so much!!! 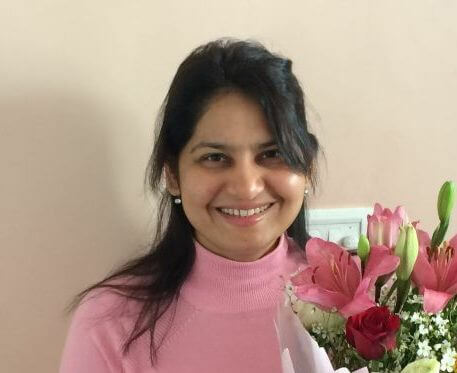 Words are not enough to compliment you ..thanku sir..very very helpful and easy to understand and the contents are in a proper manner..
@Vinay – Thank you for the feedback. 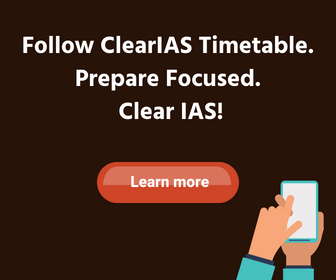 All the best for UPSC exams!